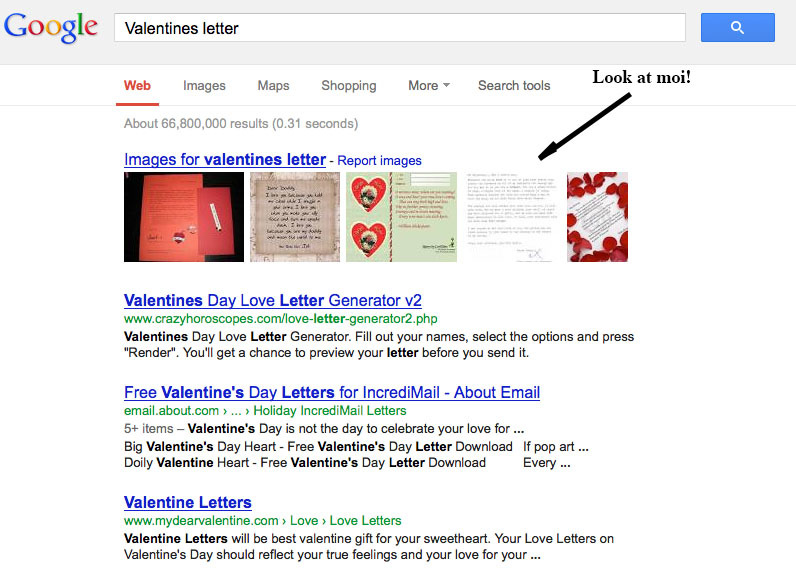 Spoiling Valentine’s day letter writing with Google. Somehow, I killed the romance of Valentine’s day via my blog. Or so the nasty little email said. I first became aware of my ruining Valentine’s day before I received a request to take down my ‘letter’. It was in my blog stats… my blog was getting hundreds of hits to my older entry about my Valentine typewriter. The stats also reveled something else interesting. They revealed that one of the top search terms that had been bringing people to my blog, had been “Valentines letter”. So I entered this into Google, and got a bit of a shock. There was my typed ‘Hate letter to my Valentine’, displayed as number 4 of the top 5 image searches for this term. Right at the very top of the Google search page. Oh lovers, how Google was not your friend this Valentine’s day! With lines like “With thoughts in mind as to how to dash your pretty keys across the hardened shell of my Remington 16”, I can only imagine how people responded when they clicked the image of my scanned letter. Actually, it gives me a bit of a giggle just thinking about it. Come on kids… (sigh) Where’s the romance! Oh well… Here’s a letter for you star-crossed lovers – or, in text speak U * X <3s, to discover next year. Let me ruin the romance for you, with some vague attempt at poetry. And thus – we have why this blog is called ‘The Filthy Platen’. Next time, just buy them flowers. It is the easiest way to say ‘I love you, but don’t really want to put any effort into expressing it’, that I can think of. 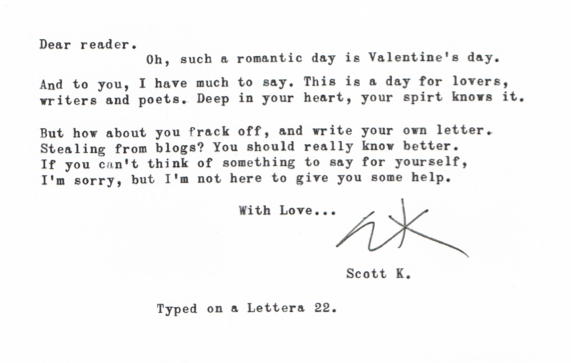 February 17, 2013 in google, love, seach, typewriter, Valentine's day letter, Valentines letter, writing. Ha ha ha. That's an excellent quote! I'm chuckling away here happily at that. And yet…it is a sad commentary on our altogether too politically-correct times. Ironic that this occurs in an era pathetically lacking in grace. You GO, Almighty Google! Google is a blessing and a curse these days. The net is so full of garbage that I often wonder how people even process this junk. Oh well… There's a few unhappy sods that copped an eyeful of something that probably didn't make sense. Good luck to them! Somehow I have! Sort of…. I'll fade into obscurity till the next Valentine's day. Indeed people are. It isn't hard to express yourself to people – and if you're looking for that perfect line, there's nothing more perfect than honesty! I know! I feel all kinds of joy! I think Google generally prefers its blogspot blogs. We might even start an online intervention of the Insurgency like that!